A daily examination of conscience will help us to “identify the temptations”, and reject “the worldly spirit” in order to follow the Spirit of God, which leads us to good works, said Pope Francis at Mass this morning at Casa Santa Marta. He was inspired by the first letter of St. Paul to the Corinthians (1Cor 2: 10b-16) in which “the apostle Paul teaches the Corinthians the way to have the thought of Christ “, a path marked by abandonment to the Holy Spirit. The Pope said “The Holy Spirit leads us to “know Jesus”, to have his own “feelings”, to understand his “heart”. And “left to our own forces we do not understand the things of the Spirit”. “There are two spirits, two ways of thinking, of feeling, of acting: that which leads me to the Spirit of God and that which leads me to the spirit of the world. And this happens in our life: we all have these two ‘spirits’, let’s say so. The Spirit of God, which leads us to good works, to charity, to fraternity, to worship God, to know Jesus, to do many good works of charity, to pray: this. And the other spirit of the world, which leads us to vanity, pride, sufficiency, gossip: a whole other road. Our heart – said a saint – is like a battlefield, a field of war where these two spirits fight “. “In the Christian life”, therefore, “we must fight to make room for the Spirit of God” and “to chase away the spirit of the world”. And a daily “examination of conscience” helps to “identify temptations”, to clarify how these opposing forces act. “It is very simple: we have this great gift, which is the Spirit of God, but we are fragile, we are sinners and we also have the temptation of the spirit of the world. In this spiritual fight, in this war of the spirit, we must be victors like Jesus “. 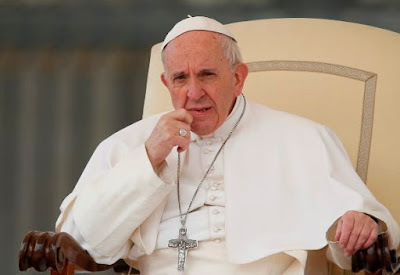 Every evening, the Pope concluded, the Christian should rethink the day just passed to see if “vanity” and “pride” prevailed or if he managed to imitate the Son of God. “Know what happens in the heart. If we do not do this, if we do not know what happens in our hearts – and this I do not say, the Bible says – we are like ‘animals that do not understand anything’, they go on instinct. But we are not animals, we are Sons of God, baptized with the gift of the Holy Spirit. This is why it is important to understand what has happened today in my heart. The Lord teaches us to always examine our conscience every day “.